Rise of the Slush: Swag, swag, and more swag! Swag, swag, and more swag! When I hear the words 'Book Convention' all I can think about is books, books, and more books. I know that I'm going to come home with books. I'll buy them, win them, and gift them. But even more than books I'll come home with SWAG! Swag comes in all shapes in sizes from pens and notebooks to postcards and pins. Some authors give out playing cards, lip balm, hats, and all sorts of awesome goodies. I plan on walking away with a bunch from my favorites. This year things are super special though. I get to giveaway my own swag. Yippee! Now, I'm the laid back very laissez faire type about collecting my own swag. My husband told me I should have ordered notebooks and pens by the hundreds over the last several months. Did I listen? Do doughnuts grow on trees? Of course not! So instead of having a bunch of everything I have a little of everything... and then came my hubby's big surprise. Psst... this is also why he's my hero. He got me 300 SHOT GLASSES! 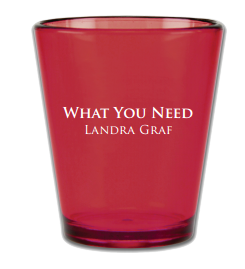 I think I need to say that again: 300 SHOT GLASSES! Your hubby is ridiculously awesome. Seriously. Wow. Kudos to him! Those look fantastic! New Orleans or Bust--- Countdown to RT!